Xenia native Carl Atley turned his truck-pulling season around with a weekend sweep in July at the North Iowa Nationals in Rockwell, Iowa. WORTHINGTON — It was an appropriate ending to a dominant year. 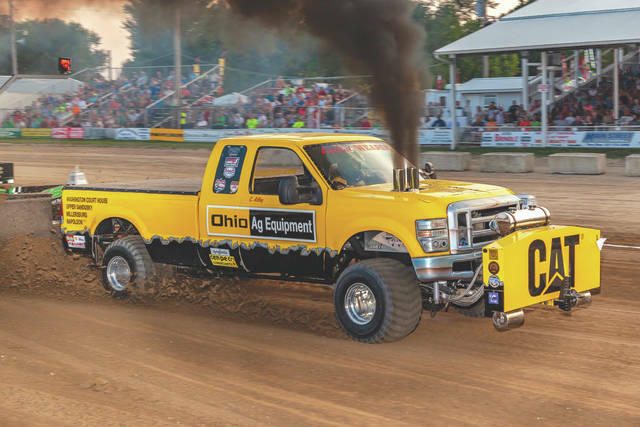 Carl Atley of Xenia, earned his first Grand National title in the Super Stock Diesel 4×4 division’s second year at that level. His “Lethal Weapon” Ford finished in the top four in 12 of 13 competitive classes during the 2018 season and visited the winners circle on five occasions (one, at Fort Recovery with Kent Crowder at the controls). The class’ reigning Puller of the Year, Atley can put to rest in everyone’s mind, including his own, the “What could’ve been” questions from last year, when he finished 10 points behind champion Josh Deeter despite having three victories to Deeter’s two. This year, after a middling start at Benson and his worst showing of the year — a seventh at Tomah, Wisc. — he gave no quarter to his challengers, rattling off two wins in Rockwell and six straight top threes. A pair of seconds in Hudsonville on the Tuesday and Wednesday after Bowling Green, Ohio opened a 10.5-point gap that could not be overcome in Sandwich, Ill. No matter: He finished with a win there, too. Atley will hope to carry his momentum into the Enderle Pull-Off in Urbana, on Saturday, Sept. 15. There, he’ll be joined by fellow competitors Shane Kellogg (“Trump,” -11.5), Justin Gearhart (“Cream of the Crop,” -19.5), Don Bowling (“Pulling for the Cure,” -40.5), and Brion Withrow (“The Nut Job,” -65.5). One of the early migrants to the SSD 4×4 division when it became a national class within NTPA, Atley previously competed in the Pro Stock tractor class with the “Lethal Weapon” John Deere 4250. He was Region II’s champ in 2016 and this year joins the elite company of Hall-of-Famers Wayne Rausch (1984 5,800-lb. and 6,200-lb. TWD) and Roy Everett (1982 6,200-lb. FWD) as champions in their truck divisions’ second years of existence at the GN level. https://www.fairborndailyherald.com/wp-content/uploads/sites/50/2018/09/web1_2018_SSD4x4_AtleyCarl_PS.jpgXenia native Carl Atley turned his truck-pulling season around with a weekend sweep in July at the North Iowa Nationals in Rockwell, Iowa. For more information about the NTPA, visit the series’ website, www.NTPAPULL.com, or follow them on social media on Facebook (ntpapulling), Twitter (@NTPApull), YouTube (NTPApull) and Instagram (ntpa).